Orieobor are proud monsters. They reside on river banks near the water and seek out areas with the excellent clay. They will spend the first few days in their new territory rolling a large clay ball, which they will then rub their neck bristles against slowly, polishing it to a shine. The uniformity and shine of the clay ball proves the monster's worth - a perfectly maintained ball demonstrates the procurement of ideal conditions and the work ethic necessary to attract a mate. 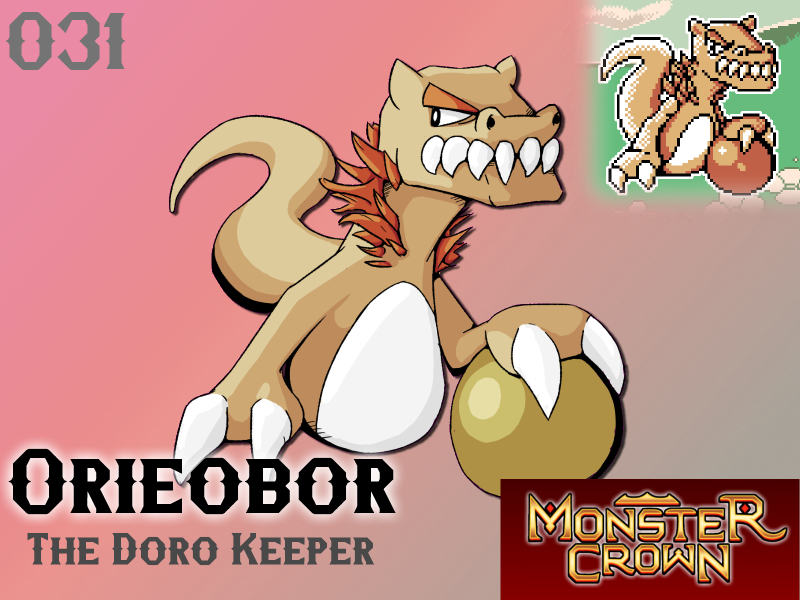 As Orieobor settles into its territory it will bask the ball in the sun, rolling it harder and adding layers until it forms a formidable boulder - one Orieobor will not hesitate to lop at foes once it has completely hardened. Tamers choosing to travel with Orieobor must be patient - the monster must be allowed regular access to fresh clay and water to hydrate and polish the clay ball, without access to both it will leave the tamer, abandoning the pact without hesitation. Orieobor kept in dungeons too long will begin to obsessively polish the boulder, eventually reaching unhealthy levels of compulsion and obsession. Will Orieobor make your team?